cautious, outgoing, lively, and energetic. The Cocker Spaniel originated comes from England, which have been brought and developed in United States. They are the oldest breed in the spaniel family in the 14th century. These breed originated from England, was recognized in the late 1880's as, which were brought and introduced to the United States. 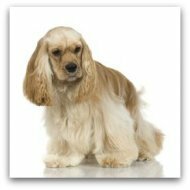 Which make these breed become different breed, which is English Cocker Spaniel and American Cocker Spaniel. These breeds of dogs was registered with the AKC in 1878. His head is short and slender, has a medium sized sturdy body. He has a enough undercoat to provide protection. Ears, chest, abdomen, and legs has a large number of feather coat. His hair is a filamentous, flat or slightly wavy, this coat makes it easy to take care. The coat colors comes with any solid colors, black, brown, red brown, light yellow, silver and black color mixed, etc. The Cocker Spaniel is a very intelligent dog, he is very easy to train dog breeds, but may be difficult to housebreak. So that the early socialization is important. They need to learn all the household rules and social manner. The training should be consistent with a firmness, fairness, and gentle hand. Grooming is a big part of cocker ownership. The long and silky coat requires daily brushing and combing in order to keep it in a good condition. Eyes and ears should be cleaned and check on a regular basis,at least twice weekly. These dog will need to trimming every four to six weeks. The Cocker Spaniel is a beautiful, lively, gentle and intelligent dog makes a wonderful playmate for kids, and are good with other family pets. Many of them likes to chase anything that is running. He is pretty easy to train, and is fine for the those inexperienced dog owner as well as more experienced owners. He is a energetic and lively dog that enjoys playing but also has a calm, gentle and dignified manner. This breed is sure to bring plenty of joy to your life.